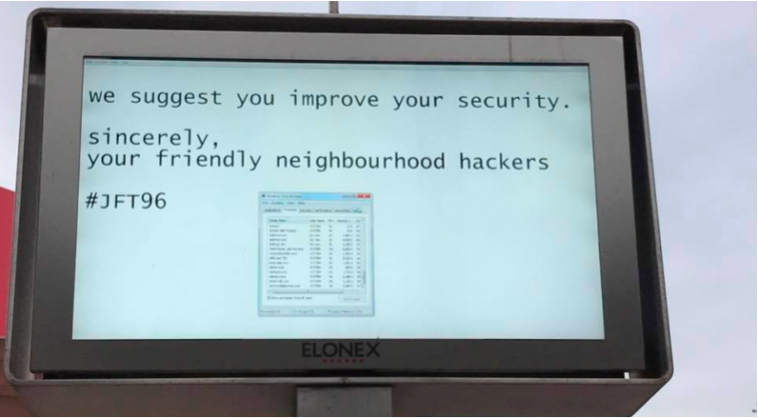 “We suggest you improve your security” and identified themselves as friendly neighborhood hackers. At the Liverpool One Shopping center, the writing appeared on a large outdoor display outside the city. The reports state that no other screens got affected but the passers-by revealed that many other billboards were deactivated due to this reason. Tampered billboards were also spotted on Twitter but the Liverpool One billboard quickly responded to the spoof and closed down the screen as soon as it was notified about the incident. But up till now, it isn’t clear who was behind the hacking incident. An external company that had been responsible for operating the screens named as Elonex is investigating this matter. The authorities are not revealing any information at the moment. The message also included #JFT96 which is likely to indicate to the 96 people who had lost their lives during a disaster in 1989 at the Liverpool football game.